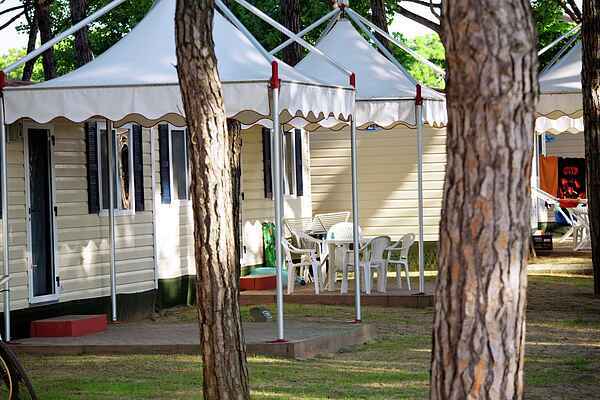 The neatly furnished mobile homes are spread throughout charming Village Cavallino holiday park. They are available in four variants: the 4-person Comfort (IT-30013-01), the 5-person Lux (IT-30013-02), the 4-person S. Marco (IT-30013-05) and the 6-person Romantic (IT-30013-06). The Lux variant is bigger and more modern in design than the Comfort type and is suitable for up to four adults and one child under 12 years old. The Romantic is suitable for up to four adults and two children under 12 years old. All mobile homes come with air conditioning (for a fee), a (covered) terrace and garden furniture. No meals are included. You can request breakfast, half board or full board on site if desired.